this is a design concept that is aimed at opening up the spaces within the yacht and creating seamless transitions from one area to the next. When Sea Ray announced the “Next Wave” initiative at the 2014 Miami International Boat Show they did indeed serve notice to other yacht builders that Sea Ray was back and forging ahead with their new L-Class Luxury Yachts. 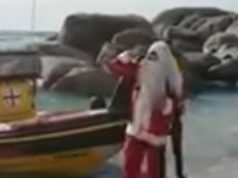 In quick succession they launched the flagship L650 Fly and L650. Just a few months later, the L590 Fly was debuted at the Fort Lauderdale International Boat Show. Following the show select media were invited to Captiva, Florida for some serious hands on time. My first impression looking across the marina at the 590’s profile was that Sea Ray had done it again, just like the L560 Fly, the design was sleek, modern, yet distinctive, the lines flowed in harmony, complementing each other, while being functional. 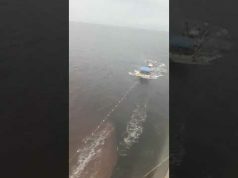 It left the impression that it was smaller than the near 59-foot length and in perpetual motion. 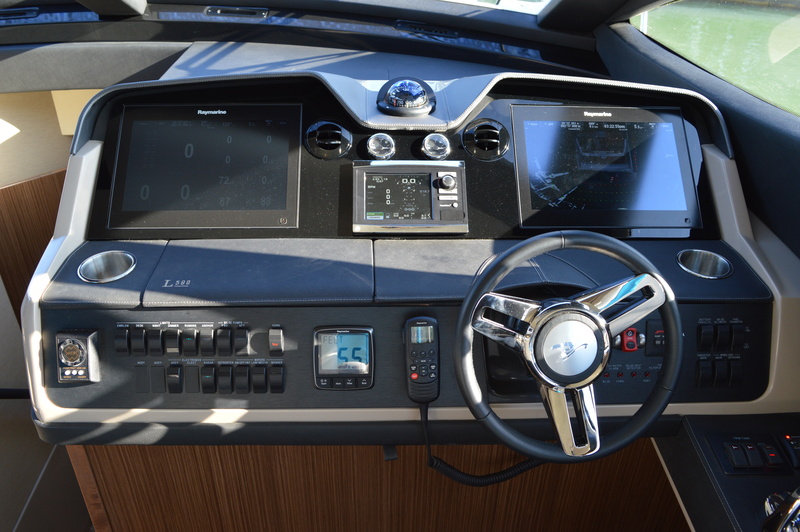 With the L Series, Sea Ray employs what they call “Sly Flow Design”. In a nutshell this is a design concept that is aimed at opening up the spaces within the yacht and creating seamless transitions from one area to the next. This has certainly been accomplished with the 590. With the four-pane cockpit door wide open, the transition from the spacious cockpit through the salon to the galley and lower helm flows. Large deckhouse windows allow for maximum natural light. The company’s “Concierge” approach to customer care, from the point of sale to the build and with the ongoing needs of their customers, is reflected in the quality and refinement one notes on the 590. 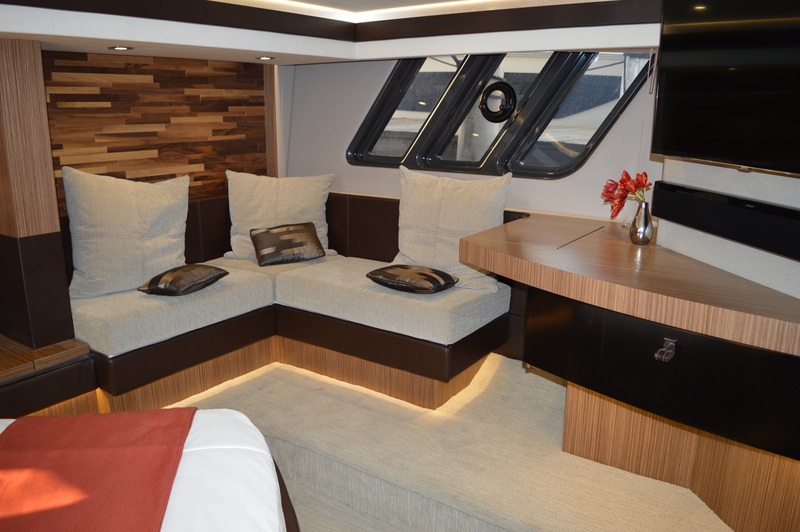 Throughout the interior, Sea Ray’s designers have made deft choices in layout and functionality accented by truly luxurious finishes, colours and textures. The company’s “Concierge” approach to customer care, from the point of sale to the build and with the ongoing needs of their customers, is reflected in the quality and refinement one notes on the 590. Choices abound, from wood finishes that include Quarter Walnut, Pangar Wenge or White Oak to flooring and carpet options. This customizability is present in everything from entertainment systems, bedding and window treatments, to ships systems and more. The galley flows along the port side and under the forward windscreen. Topped with a solid surface counter it is as functional as it is elegant with the under counter appliances hidden by the wood cabinetry. 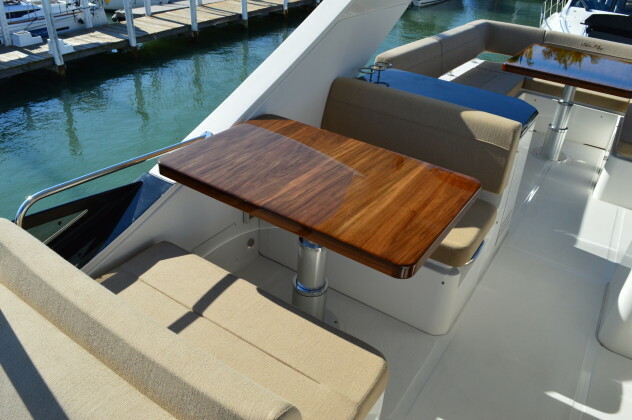 Opposite, between the salon and lower helm, is a comfortable raised dinette. Below, the accommodations extend the first class approach as is evident in the finishes, furnishings, small details and flourishes. 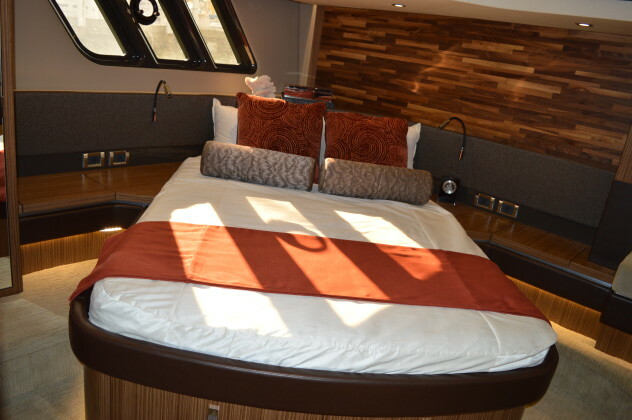 Fully forward is the guest stateroom, complete with a queen innerspring island berth, excellent storage, an entertainment system and private access to the head. The head is trimmed in wood, solid surface counters and accents, a vessel sink and a separate shower, all bathed in natural light. The mid stateroom features twin berths, a large hanging locker and large hull side window with opening port. The full beam master is truly a space that owners can enjoy. 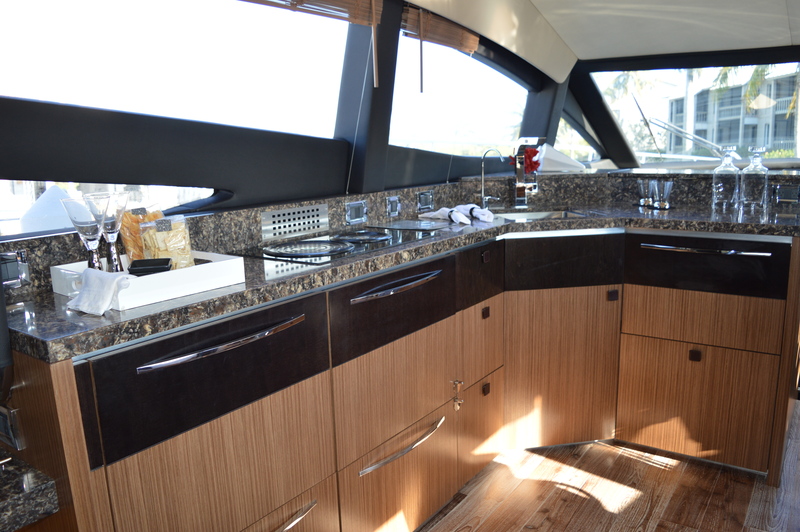 Large hull windows flood the room with light that showcases the finishes and cabinetry. 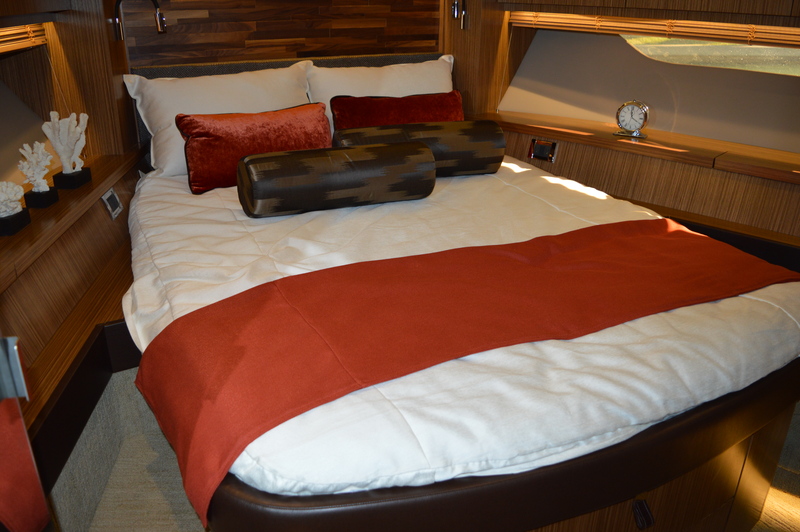 Features are abound with twin night tables, extensive closets, a lounge area and a workstation. 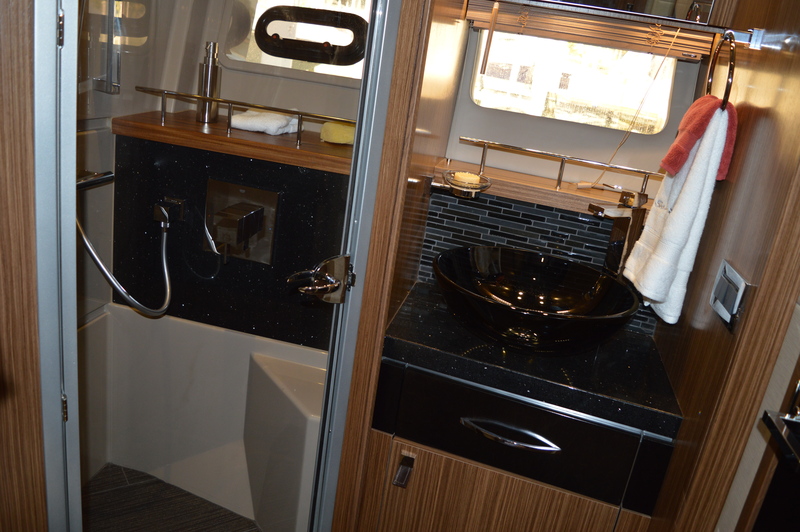 Beautifully appointed separate shower, head and vanity spaces are conveniently placed off the stateroom entrance. The comforts and conveniences found within extend to the bridge. The extension over the cockpit is massive and features three zones. Aft, a settee wraps around a table for dining and relaxing. A full refreshment centre with grill is found to port, behind the helm. A dinette creates a second social zone opposite the helm. Forward, behind the venturi windscreen are two adjustable sun pads. 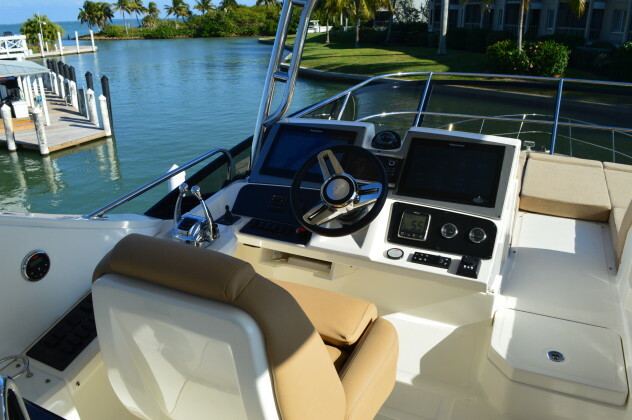 In powering the L590 Fly, Sea Ray elected to break with tradition. Twin diesels of 800 or more would normally be specified. Instead Sea Ray elected to install three smaller and lighter Cummins QSC 8.3-600s coupled to Zeus drives. 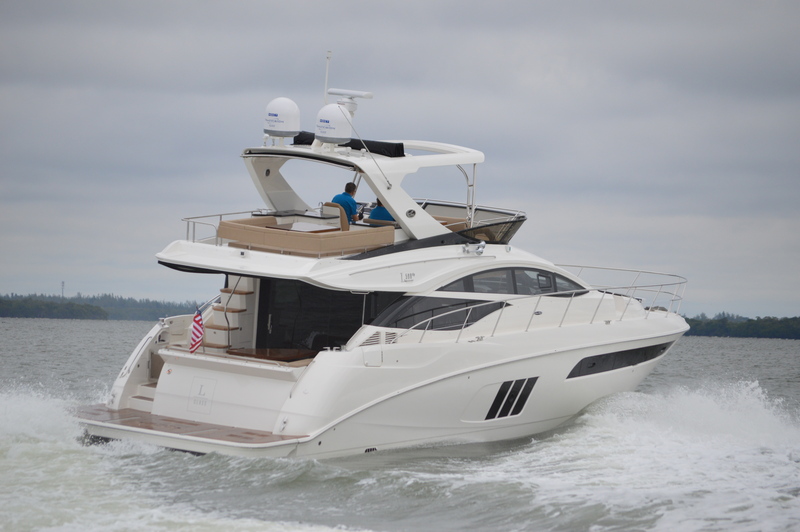 When asked for the rationale, Sea Ray listed three key reasons – performance, economy and space. Interestingly the three Cummins Zeus packages weigh in at or below the specs for twin inboards that would deliver the same 1,800 horsepower total. 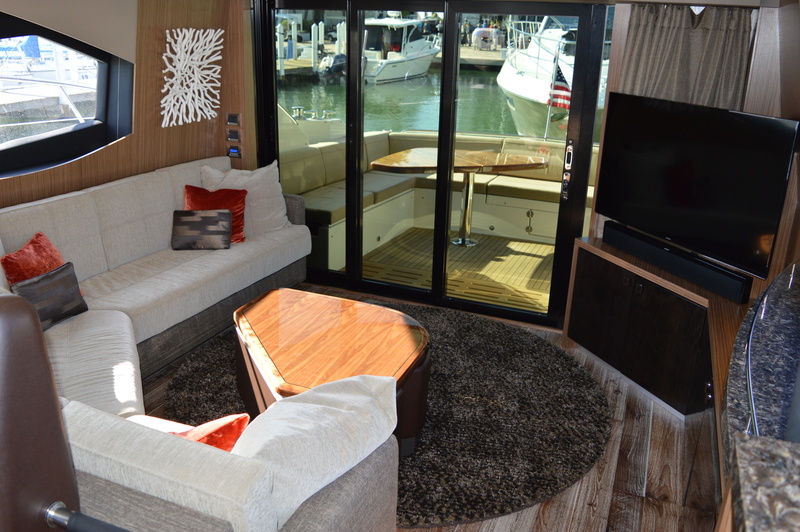 The result is a luxury flybridge that flies. Top speed, lightly loaded was an impressive 31 kts or 35.7 mph. Acceleration, once the turbos spooled up, was surprising for this size and class, taking only 13.3 seconds to pass through 20. In terms of fuel economy –and that’s a relative thing, the 1,800 hp does burn some fuel, around 97 gallons per hour or 367 litres per hour to be exact. What’s interesting is that burn rate and a range of 300 to 304 nautical miles is consistent at all throttle settings once on plane. Impressive! While underway, captaining the L590 was pure pleasure. Since fuel burn was not an issue, I was able to run the luxury yacht like a sport boat during testing. What I discovered was a quiet, smooth and dry running hull that was well matched to the Cummins Zeus power. Handling and turns were precise, tight and smooth –all characteristics that not only instilled confidence, but also were pleasurable. Whether you opt for piloting at the upper or lower helm, every requirement and convenience has been addressed. A full range of Raymarine electronics is available for both stations. SmartCraft Vessel View and SmartCraft Diagnostics and instruments handle engine and systems data. It goes without saying that the Zeus drives ensure that the L590 Fly is well mannered around the docks. Joystick control truly simplifies all aspects of handling in close quarters. With the upper helm to port, the lower helm to starboard and an optional remote joystick behind on the bridge, you can always find a station with a clear sightline for docking without opting for the Command View Video Docking System. To sum it all up, the Sea Ray L590 Fly is a true luxury yacht that flies if you want it to. This boat is featured in the Spring 2015 issue of Boats&Places.